Petunias are popular annual flowers in most American gardens. They are easy to grow and are very pleasing to the eye. They enjoy a long blooming season and add plenty of color to your garden. There are many types of petunias available. So you can choose the one that matches your needs the best.There is Grandiflora which is the largest in the petunia family and blooms as wide as 3 to 4 inches. They generally grow upright, though some tend to cascade. Since they come with large and tender blooms, Grandifloras are susceptible to damage and rotting in hot, humid summers. Multifloras are smaller and prolific bloomers, considered more durable than Grandifloras. Somewhere between Grandifloras and Multifloras lie Floribundas, which give a good quantity of medium-sized blooms. The smallest blooms are founds in Millifloras, which look good in low borders. 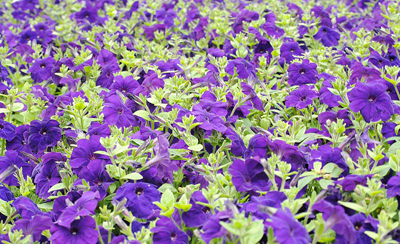 Ground Cover Petunias, also known as Spreading or Trailing Petunias, are the ones which grow quite low, often not making it higher than 4 to 6 inches above the ground. They however spread wide and hence the name. This is the newest class of petunias, and is by far the most popular of petunia varieties today, especially in the South, where the Grandiflora is known to be a poor performer. You will see plenty of houses there with window boxes or baskets with colorful Ground Cover petunias hanging from them. These petunias are known to spread fast and form a dense cover along the complete length of the stems, made up of brightly colored flowers. 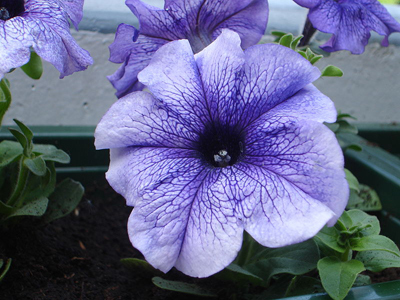 Petunias are blooming flowers, which can be grown in home gardens, flowerbeds, hanging baskets, pots, barrels, window boxes or any other kind of flower planter. These pretty flowers bloom continuously from spring to frost, and come in a large variety of sizes and colors. More..